Anyone can post a link on Facebook or in a blog right? Do you know how to hyperlink so other blogs find out? Do you reach out to others about sharing their content? Social media is in it’s infancy, but more and more brands and businesses are getting on board. It can be stifling when you focus on sharing content of others to get their attention, but then they ignore you. If you are sharing content in order to get their attention and thet don’t respond, don’t waste your time. You should be spending your efforts getting the attention of those who do care, because it will pay off in the long run. SEO, aka Search Engine Optimization, is the principal of strategically using key words, links and shares to have your content get to the top of google. This article will only scratch the surface of SEO, but it is important to have a basic knowledge. 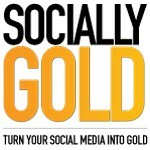 You can apply principles of SEO to your social media strategy, especially Facebook and Twitter. I use WordPress.org for my social media blog and it extremely easy to manage. If I were to link an article that someone else wrote on their blog, they would get an alert. This functions just like Facebook t& Twitter tagging, which is not to be confused with @replies. Twitter @replies only will be seen by the user who you are replying to and those who mutually follow you and that person. If you @reply to Justin Beiber, and none of your friends follow him, your tweet will not show up in their feed. Twitter recognizes the first character in your tweet as the @symbol and only shows your tweet to mutual followers. Add a “.” in front of your @reply so all of your followers see your tweet, and not just mutual ones.
.@socially_gold Thanks for coming! I had a great time and learned a whole lot. Bring a bit of that Austin weirdness back to South Florida! Use tagging on social media sites to get the attention of other pages. If they have a social media strategy, they will engage with you, which will increase your exposure. 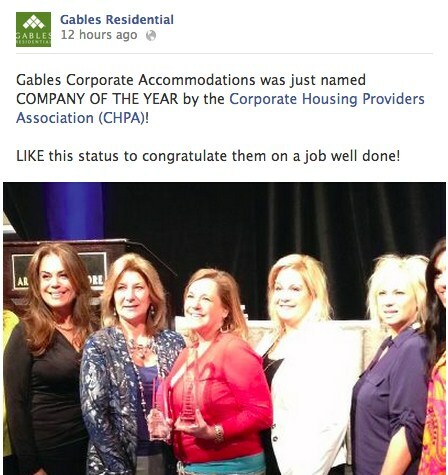 In the above example, a division of the company I currently work for, won Company of the Year as awarded by the Corporate Home Providers Association. I tagged their Facebook Page to not only get their attention, but to promote them as well. I promoted them without their solicitation and am hopeful that they will share some of our content in the future. At the time of this article, they had not responded. This affects my social media strategy in that they don’t have a dedicated social media manager responding to comments. The award was given on Feb 6th and they have yet to change their cover photo advertising the event that was Feb 4th-6th. (This portion of the article was written on Feb 8th). I wouldn’t rely on this page to help with my strategy. The lesson here is to be strategic with who you promote on your page, your blog and your twitter account. Go after those that are more likely to interact with you, then those who don’t.